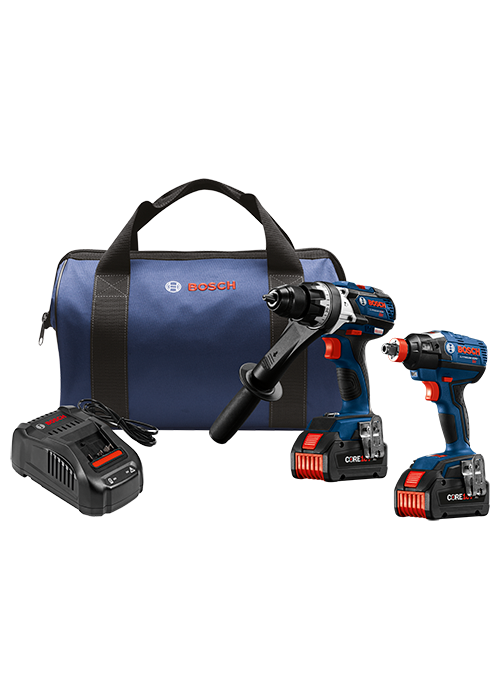 The Bosch GXL18 V-225B24 18 V Combo Kit provides cordless productivity and versatility. It includes two CORE18 V batteries – the best-built battery on the planet – and two powerful tools. The IDH182 EC Brushless 1/4 In. and 1/2 In. Socket-Ready Impact Driver takes screwdriver bits and sockets, for an all-in-one tool with driving power – up to 1,650 In.-Lbs. of torque. The HDH183 Hammer Drill/Driver features KickBack Control, which reduces the risk of sudden tool reactions in binding conditions. It is engineered with an all-metal chuck and an EC Brushless motor delivering 663 In.-Lbs. of torque. Each CORE18 V 6.3 Ah battery provides 80% more power than the previous-generation batteries, providing performance comparable to competitor batteries that are up to 35% larger. It features CoolPack 2.0 technology for longer battery life, and it is backward and forward compatible with all Bosch 18 V tools and chargers. The included Bosch BC1880 18 V Fast Charger can charge a spent CORE18 V to 80% in 41 minutes.